This is the eleventh installment of the Who Runs San Diego? series, a project of the Democratic Woman’s Club, published weekly in the OB Rag. The Democratic Woman’s Club mission is to promote Democratic Party principles including equality of opportunity, a level playing field, and fair and equal treatment for all. The first article on SeaWorld can be found here. I am writing to express my support for AB-2140, the Orca Welfare and Safety Act as put forward by Assemblymember Richard Bloom. I support the bill because it provides an end to the captive breeding of orcas in California and their use in performance-based entertainment, while allowing for the rehabilitation of rescued or stranded orcas until they can be safely returned to the wild or to a sea pen. As much as I sometimes dislike the way that SeaWorld does business, I wouldn’t necessarily want to the see the park closed, or jobs and tax revenue lost. However, I’m convinced that we should somehow begin to make the transition from amusement parks to ocean sanctuaries and sea pens for captive orcas. As a child, I enjoyed going to SeaWorld and watching the “Shamu” killer whale show. As an adult, I have come to appreciate that orcas are too large, too intelligent, too powerful, and too social (family-oriented) to be adequately confined at amusement parks structured for profit. Frustrated captive orcas have broken their teeth by chewing on gates and enclosures. Their dorsal fins have collapsed. They have died prematurely— rejected their young—and have even harmed and killed humans. Whatever benefits have been gained from keeping orcas in captivity cannot offset the loss of four young adults who have been killed by orcas in the marine park industry. Enacting the bill could prevent similar tragedies from happening in California. After 50 years of displaying orcas for human amusement as well as studying them in the wild, we have learned enough about them to understand that they do not belong in captivity. 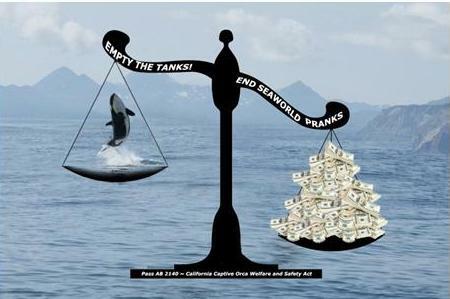 Assemblymember Rendon – the “Shamu” show has got to go. Enact AB-2140, the Orca Welfare and Safety Act.